When this strip ran a short while ago, a number of readers were curious as t0 the “Thanks, Andy” attribution. 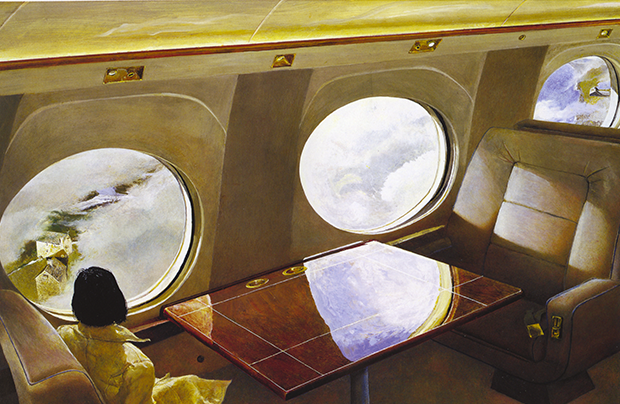 Late in his career Andrew Wyeth created a painting called Otherworld in which he depicted a young girl looking out the window of a private jet. Through one of the windows we look down on the Olsen farm and the Kuerner farm through another. Both of these farms were iconic settings for many of his best remembered paintings. In an homage to Wyeth and to Otherworld, I used the same setting to depict two of the set stages for my own work in Funky… Les and Lisa’s house and the Crankshaft homestead. I’ve long admired the way Wyeth revisited familiar settings to bring a certain verisimilitude to his work. I’m sure it influenced me to adopt a similar work method to ground my own work. Hence, the tip of the Funky felt tip in the strip.